Israel's p.r. 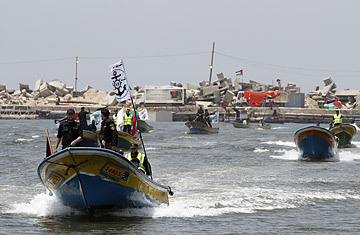 machine has gone into overdrive this week to counter the impact of a nine-ship flotilla en route from Turkey that is carrying 10,000 tons of medicine and construction materials and 700 pro-Palestinian activists to the besieged Gaza Strip. Israel has vowed to stop the ships from reaching their destination, painting the flotilla  a civil society initiative that has the support of the Turkish government  as a "provocation." The humanitarian situation in Gaza "is good and stable," Colonel Moshe Levy, the Israeli military officer responsible for Gaza, said on Wednesday, who insisted that Israel allows in basic necessities. Israeli officials added that smugglers' tunnels keep the shelves of Gaza's stores full. Referring to those goods not allowed to pass through, Levy said, "There are some things that are not permitted because Hamas exploits the humanitarian situation to improve its military capabilities." The Israeli Government Press Office (GPO) even sent news agencies a message recommending a "luxurious" restaurant in Gaza City. "In anticipation of foreign correspondents traveling to Gaza to cover reports of alleged humanitarian difficulties in the Hamas-run territory ... the Government Press Office is pleased to bring to your attention the attached menu and information for the Roots Club and Restaurant in Gaza," the GPO message said, according to AFP. "We have been told the beef Stroganoff and cream of spinach soup are highly recommended." The problem facing the Israeli p.r. effort is that few neutrals are likely to accept Israel's bona fides as a champion of the welfare of ordinary Gazans. Not after a three-year siege whose goal has been to squeeze the civilian population in hopes that it would overthrow Hamas  and a January 2009 military operation in response to Palestinian rocket fire that left more than 1,200 Palestinians dead, many of them civilians. Then there's the fact that international humanitarian organizations tasked with sustaining Gaza's civilian population are saying that while Israel allows in humanitarian supplies, those fall far short of the needs. The U.N. welfare agency UNWRA reports that the number of Gazans dependent on food aid trebled in 2009 to 300,000  1 in every 5 people living in the territory. The World Health Organization reports that there are shortages of essential medicines and that chronic malnutrition has reached 10%. Even Israeli human rights groups have challenged the blockade, forcing the government  through a court action  to reveal that under the rubric of preventing Hamas from improving its military capability, Gazans are prevented from importing such items as chocolate, jam, wood, fruit juice, plastic toys and notebooks. Cinnamon is allowed, but not coriander. The Israelis are right, of course, that the convoy en route from Turkey is not simply a humanitarian gesture but also a political protest against the siege and the principle that Israel gets to decide what spices Gaza's cooks are able to use. The convoy is stepping into the void left by the policies of Israel, Egypt and the U.S., none of which offer any prospect of ending Gaza's misery. U.S. President Barack Obama, in his speech to the Muslim world in Cairo last June, warned that "just as it devastates Palestinian families, the continuing humanitarian crisis in Gaza does not serve Israel's security." But a year later, there has been little substantial movement on the siege. And while the settlement freeze that Obama demanded in his speech became the focal point of his Administration's troubled relations with the Netanyahu government in Israel, the siege of Gaza remains unmentioned. The territory, and its Hamas rulers, have become the elephant in the room of the U.S.-brokered peace talks between Israel and the Palestinians. Neither the Israelis nor the Palestinian Authority, each for their own political reasons, want to talk about Gaza, and the U.S. has, until now, appeared content to allow them to skirt the issue. But the corrosive effect of the siege on Gazan society has prompted some governments and civil society groups to step in where the major players are failing. Two weeks ago, Israel turned down an offer from Qatar to reopen diplomatic ties with the Jewish state in exchange for Qatar's being allowed to undertake badly needed reconstruction projects in Gaza. And the diplomatic price Israel is paying for its Gaza policy is underscored by the actions of Turkey, previously one of Israel's key regional allies. The government of President Recep Tayyip Erdogan has repeatedly condemned the blockade of Gaza, and it urged Israel on Wednesday to refrain from stopping the aid convoy, which includes two civilian Turkish vessels. The civil society movements that have contributed to this and previous relief protest efforts hark back, in style, to the grass-roots origins of the anti-apartheid movement that emerged in Europe, and eventually the U.S., in the 1980s  which started out with small citizen initiatives to pressure South Africa over the fate of its black population but evolved into mass public pressure, forcing Western governments to impose sanctions on Pretoria. There's no imminent danger of Western governments' imposing sanctions on Israel  on the contrary, next week they will welcome it as a member of the prestigious Organization for Economic Cooperation and Development. However, the aid convoy is indicative of a growing protest movement, among citizens and some governments, over the situation in Gaza. Meanwhile, the long-suffering civilian population of Gaza is being offered little hope by anything the U.S. or Egypt, let alone Israel, is doing  or by the defiance of Hamas. The movement's popularity has certainly been eroded by the deprivation imposed under the siege, and there are more open challenges to its authority now than there were three years ago. The problem is that the most visible challenges to Hamas' authority often come in the form of attempted attacks on Israel in defiance of a Hamas cease-fire order, undertaken by even more radical, al-Qaeda-oriented groups.